Hi, friends! Want to give someone a gift card for their birthday, graduation or some other special occasion? Why not make a colorful pocket to give it in! 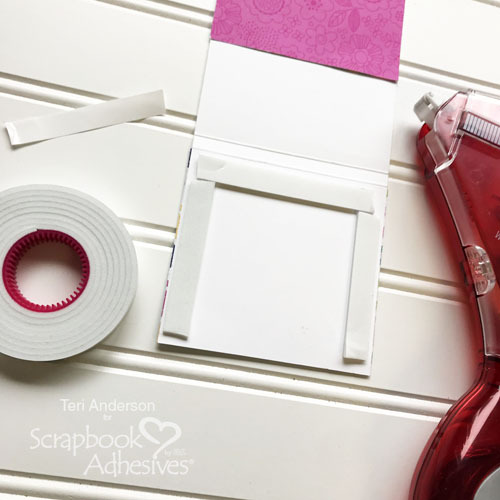 I’ll show how with products from Scrapbook Adhesives by 3L® and a few basic crafting supplies in this quick, easy tutorial. 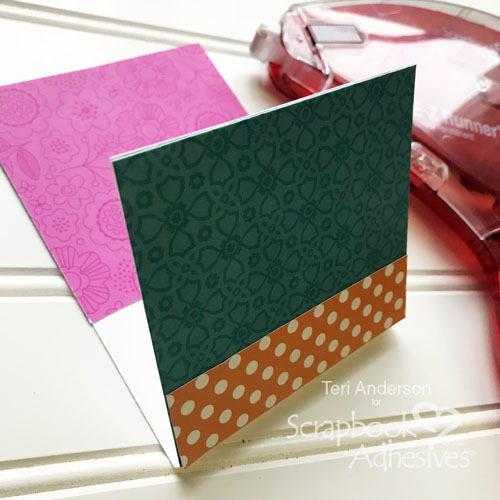 Start by cutting an 8 1/2″ x 3 1/2″ panel of cardstock. Set it on a scoring board horizontally. Score lines at the 5″ and 5 1/4″ marks. 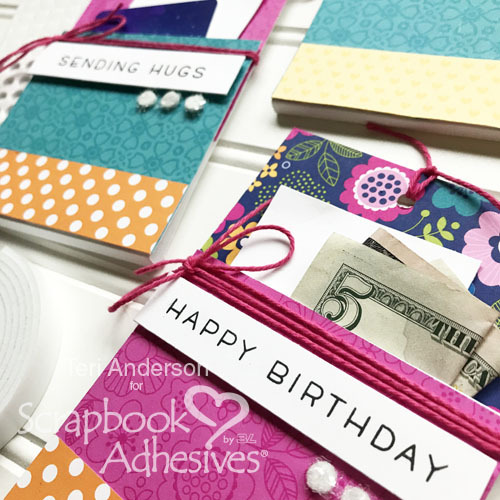 Add patterned paper to the inside of the pocket, as well as the outside. Be sure to fold the paper along the score lines so you don’t cover the folds with patterned paper. Open the pocket up. Use Crafty Foam Tape to make a “U” along the pocket. Make sure you don’t put any at the top or you won’t able to place anything in your pocket. 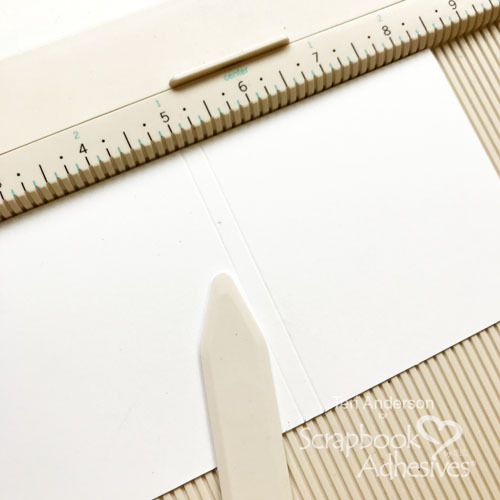 Remove the backing paper from the tape strips and seal the pocket. Decorating the Gift Card Pocket! Now, you that you have the pocket, you get to decorate it! Use a hole punch to poke a hole at the top of your pocket. Then add a stamped sentiment. I stamped my sentiment on a strip of cardstock and then adhered it to the pocket with Crafty Foam Tape. 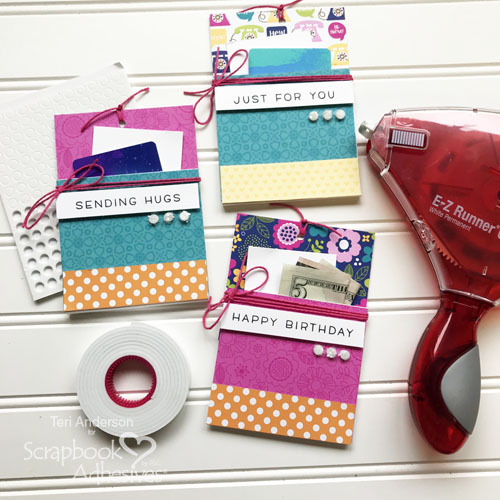 I love using the tape rather than a flat adhesive because it adds dimension and really helps draws attention to the words! Tie some twine around the pocket. Also, add a little twine to the hole at the top of the pocket. Not a fan of twine? Use ribbon instead. Complete your pocket by adding a little sparkle! Take a couple 3D Foam Circles and dip one side of each one in glitter. Adhere the circles to your pocket. Stuff a gift card in your pocket. 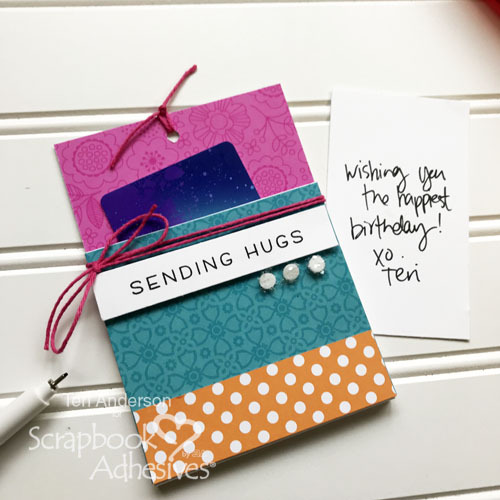 For an extra special personal touch, cut a piece of cardstock to fit in it too and write a personal note. 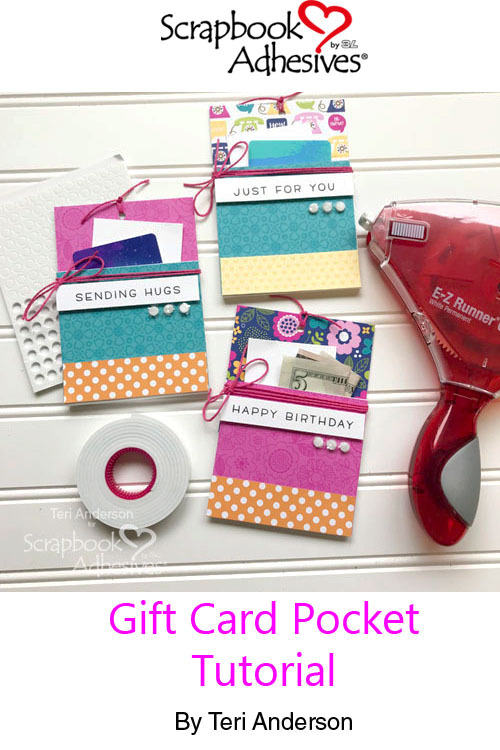 One thing that is super cool about these pockets is you don’t have to use them to give a gift card. You can stuff cash in them too! Simply fold a bill or two and place it in the pocket instead. This entry was posted in 3D Foam Circles, Adhesives, Beginner, Cards, Crafts & Tutorials, Crafty Foam Tape, E-Z Runner® Grand, Gifts, Permanent Adhesive, Skill Level, Tutorial, Wear your Adhesive on the Outside and tagged 3D Foam Circles White Mix, Bakers Twine, Birthday, Crafty Foam Tape White, Doodlebug Design, E-Z Runner Grand Dispenser, E-Z Runner Grand Permanent Strips Refill, E-Z Runner Permanent Strips, E-Z Runner Permanent Strips Refill, E-Z Runner Permanent Strips Refillable, E-Z Runner Permanent Strips Refillable Value Pack, Gift, Gift Card Holder, Glitter, Lawn Fawn, Teri Anderson, Tutorial. Bookmark the permalink.